We’ve always had our doubts about Mrs Green. She lives at the edge of town in a row of abandoned houses, and most of her neighbours have mysteriously disappeared. She keeps herself to herself and spends a lot of time – maybe too much time – with her plants. Many visitors to her house have mysteriously vanished and even we aren’t entirely sure whether to step in or not. So we follow game provider Genii into Mrs Green’s Plant Emporium to catch a glimpse of what really happens inside this crazy house – and we promise you won’t be disappointed! 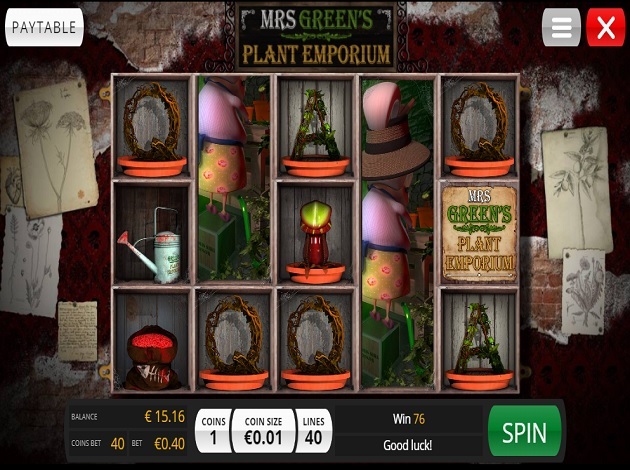 Mrs Green’s Plant Emporium is a video slot with 5 reels and 3 rows, which look like creepy garden shelving. Choose the number of coins (maximum 5) and the number of lines from 1 to 40 on which you want to play on this game with an RTP of 95.89%. The min bet, is of € 0.01 and the maximum stands at € 50. It’s a high volatility game which offers plenty of fun, chances to win and a nifty Free Spins mode. Three or more Free Spin symbols landing anywhere on the reels will trigger the Free Spins mode, which cannot be retriggered. However, Mrs Green can make wins grow faster than her plants, so you get a 2x multiplier on your wins during the Free Spins mode. Three scatters will award you ten Free Spins, four scatters earn you 15 Free Spins and 5 scatters earn you the maximum of 20 Free Spins. Mrs Green herself appears as a Stacked Wild on the reels, substituting any other symbol except for the Scatter. In the Normal Spin mode, Mrs Green lands on reels 2 and 4 only, and during the Free Spins it will be present on reels 1, 3 and 5. The J, Q, K and A symbols come in flower pots and offer the lower payouts in this video slot. The J and Q offer 4x, 8x and 20x your bet per line for 3, 4 and 5 hits respectively. The K symbol pays from 6x to 30x for five of a kind, while the A symbol starts from 8x to a maximum of 40x. The regular game symbols include a bloodied watering can (10x to 50x), a sack of seeds with a fish skeleton on it (20x to 80x), gardening gloves (obviously bloodied) and four carnivore plants – the red plant (45x to 250x), the blue plant (50x to 1000x), purple plant (55x to 1500x) and the green plant (60x to 2000x). Welcome to this crazy Plant Emporium: after a quick tour of the shack, we have reason to believe Mrs Green is up to no good. There are creepy plant drawings behind the reels, which seem to detail plants that might bite your head off at any minute. Despite her innocent looks, Mrs Green gets a Jekyll-and-Hyde moment when her stacked Wild lands on a winning payline – she turns to you looking rather furious, holding a bloodied blade. Creepy surroundings aside, the game is a real work of art from Genii and is rendered in stunning graphic detail. Symbols landing on paylines are animated – plants change colour or twist as if they are looking at them, while the water can and the gloves also come to life. The controls are easy to find and use – set your wager amount from the control panel below the reels, and access the paytable from the top left or further options (sound, fullscreen mode and autoplay) from the menu at the top right of the screen. Genii have made a great effort to create a top video slot, which comes with a decent RTP and top notch graphics built around a dark humoured theme. Mrs Green, our not-so-innocent neighbour, is now on Videoslots.com together with her plants – we wish you a great time at Mrs Green’s Plant Emporium but, oh, stay safe. Some of the games provided by Genii are Mermaid Serenade, Tomahawk, Runaway Train, Wild Wizards, Aladdin´s Loot, and much more. You can read more about Genii right here, and you can check out their portfolio at Videoslots.com.